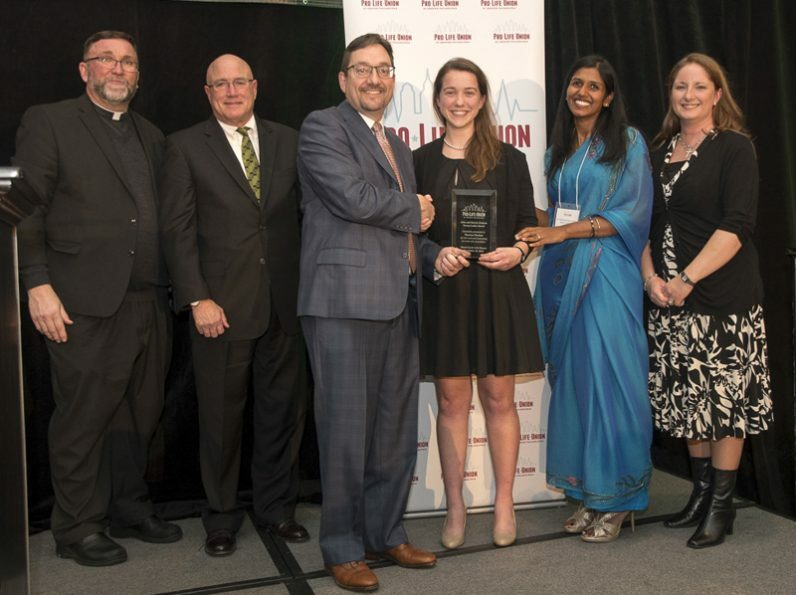 University of Pennsylvania student Theresa Dierkes, center, receives the John and Harriet Stanton Award of the Pro-Life Union of Greater Philadelphia, which held its annual dinner Nov. 18 in Philadelphia. There are almost 22,000 students at the University of Pennsylvania, of which more than 10,000 are undergrads. The university’s pro-life group, Quakers for Life, formerly Penn for Life, has maybe 15-20 core active members, according to a group leader, Theresa Dierkes, a junior majoring in nursing. If that can be somewhat like John the Baptist, a voice crying out in the wilderness, Dierkes could take comfort in being one of three honorees at the Nov. 18 Pro-Life Union of Greater Philadelphia’s annual Stand Up for Life Dinner held at the Philadelphia 201 Hotel. There were more than 1,200 committed pro-lifers in attendance, which is not unusual for the Pro-Life Union. Her award was the John and Harriet Stanton Award, named for the Pro-Life Union pioneers. Dierkes’ own pro-life chops are genetic. Years ago, her dad was arrested while witnessing for life at an abortion clinic. She is number five of the eight children of Meg and Bill Dierkes, preceded by Peter, Catherine, Andrew and Elizabeth and followed by Stephen, Maria and Thomas. The family has membership in St. Andrew the Apostle Parish, Drexel Hill. She was home-schooled during her elementary grades, something she would consider doing for her own children in the future. From there she went on to Merion Mercy Academy and while the teaching at the school was definitely pro-life Dierkes was surprised to learn that many of the students were not, and simply would not even discuss it, which was frustrating. Her own personal commitment to the cause really solidified around her sophomore year in high school through a retreat at the Franciscan University of Steubenville. “During Adoration, I really felt a calling to do something more for the pro-life movement,” she said. Just how, she didn’t immediately decide and put it on the back burner. It really didn’t gel until she got to Penn and joined the Newman Catholic Center, of which she is now an executive board member. Although music has always been part of her life, both as a singer and instrumentalist, she dropped out of Penn Singers to focus more on the life issues. With that said, music and song are still an important part of her praise and worship. Over the years she has made the annual March for Life in Washington four times. Last year she intended to make it again and toward that end organized a small group. To her great disappointment it conflicted with a required class program and she could not personally accompany the group. This coming January she hopes to have a busload going to the march, combining the Penn students including herself, with nearby Drexel University and University of the Sciences students. Meanwhile, as a very hectic schedule permits, she witnesses before abortion facilities as part of Forty Days for Life, which can be distressing when women enter the clinic but exhilarating when some change their mind. But you don’t have to go to a clinic to pray. At the university she has also organized a small prayer group that prays at nearby St. Agatha–St. James Church for women and the unborn. As for the future, pro-life activity will continue. After college, “I want to go into labor and delivery nursing, or go into school nursing,” she said. If anything, she will be even more active. “In college you have so little time,” she said. However she approaches it, prayer will definitely be part of the picture.